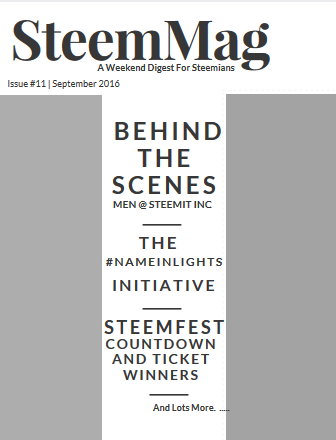 It is with great pleasure that I welcome you guys to this special eleventh edition of SteemMag, a weekend digest for Steemians. This Weekend Special Edition has exciting packages you would like. Last week, I interviewed Steemians who contributed immensely to the creation of Steemit… This weekend, in furtherance of the “Steemit is 5” theme, we take a look at the present: individuals who are working tirelessly to fuel the growth and expansion of Steemit…. I also reached out to @williambanks , the initiator of the #nameinlights feature. A dedicated initiative towards highlighting Steemians esp minnows. SteemMag had a chat with @jamesc, one of the biggest whales on Steemit and An Official Steemit Dev. I had a really interesting, intellectual chat with him. I’m sure you would enjoy it. Hello. A lot of Steemians would like to know more about you and how you started working for Steemit? Well, it’s a fun story actually. I’ve known Ned for quite some time and he was actually the person who introduced me to the crypto space back in 2013. Fast forward a few years and many conversations later, and Steemit was founded. Obviously that was very exciting and so Ned and I kept in touch throughout that process. Once Steemit started taking on a life of its own and really growing into something special, we had some conversations about what value I could bring to the table given that my previous life touched a lot of operational components and departments. We both thought I could add value to the business/ops side of things and I obviously couldn’t pass up the opportunity. If you're interested in learning a bit more about me on a personal level, you should check out my ‘Introduce Yourself’ post @amcq. A day in the life at Steemit is a pretty cool thing right now. We’re at a place where we’ve organically grown to have this awesome, really knowledgeable, user base. That has made us realize that not only do we have a platform that has unbelievable potential, but also that our community is one of the premiere and smartest communities out there. So right now we’ve got our roadmap, we’ve got things we know we need to do and develop, and then you have changing dynamics within the community. That stimulates a lot of discussion about what else we can do and how the community plays into helping us reach our potential. The possibilities are really endless and that creates a lot of great discussion – some of which you see pop-up on Steemit from Ned or Dan! First, just reading the site and blog posts every day, the new topics that are posted, new members who come on board, new authors who are discovered, existing community members coming together and building rapport; that is really exciting and gives me personally a lot of optimism for our future. Second, you’ve got to remember that we are still a startup and we are still running lean. That means I’m learning something new every single day while adding value and that’s a really fulfilling feeling. How do you de-stress especially after the round-the-clock fixes? Believe it or not, and this seems to be a really unpopular position, but I still really enjoy talking on the phone. But, I’ve got a good group of friends that call each other and that’s always relaxing. In addition to that I’d say there is some combination of catching up on TV (I’m excited for ‘The Walking Dead’ to return – but also still really ticked at them for the way they ended last season) and exercising. What's your favorite feature on Steemit? And what features should Steemians look forward to in the future? Favorite Feature: We just released a ‘Resteem’ feature. Maybe it is just because the feature is so new, but I love it because it has the ability to help the greater community discover a lot of content that they might not otherwise see. If somebody you follow reposts an article, that’s going to get your eyeballs on it and it’s going to do so in a way where you automatically place some value on the reposted article because you value the person who reposted it. I think that feature is going to create a lot of opportunity and growth. Upcoming Feature: I can tell you that we are really looking to beef up the social media aspect of Steemit to make a much friendlier, feature familiar, user experience. There are a lot of good things to come here that will enhance the Steemit experience. Your personal message to Steemians? Thank you. We wouldn’t be where we are today without you and we aren’t going to reach our full potential without you either. You’re the lifeblood of this community. But know that being such an influential part of the equation comes with a lot of responsibility. We love to see unique, insightful, and clean content. We love to see our community members build bonds and friendships. We love when the community uses the Steemit platform responsibly and in a polite, constructive manner. We love when new users come on board and they are embraced with open arms and given a voice. If we can continue to do those things, we’re going to do really, really well. What inspired the #nameinlights initiative? Ok so #nameinlights comes from a couple of inspirations. @beanz was a primary inspiration. She had a post where she highlighted @kaylinart and I said to myself, ya know that's really cool maybe I should do that myself! So there was that and there was also the fact that I was coming up on a milestone and I like to celebrate milestones with my followers by introducing them to each other. There was also a posting by @lorddominik007 where he asked people to stop following him and stop upvoting him unless they were reading his stuff. I realized that I follow people forever once I see even a single quality post out of them. It's a method of self curating. I check trending once a day and see if anyone is new there and I go through new people looking for something I like. If I like them I'll follow them upvote and let them know I was there. Unfortunately this means my feed is literally scrolling by as I watch it and if I don't catch someone soon enough they'll scroll off the end of the page. They'll get buried and I'll never find them until I think of them again. How has it been so far? What was your reaction when you discovered it was widely adopted? I was simply ecstatic to see #nameinlights take off. I did an earlier one called #payitforward and it rarely saw anything. But I lucked out and @jacor took this and basically completely owned it. @jacor has spent so much more time on it than I have. I actually need to run another #nameinlights thus far I've only managed to get one out by myself and that was @beanz. Everyone is doing great though and I love seeing this get traction! Whats your favorite highlight so far? These are all examples of minnows who don't have a large following (at the time) really taking time out and trying to uplift people that reached out and touched them. Sure these posts didn't make much money in their day. But that's what resteeming is for right? What excites you about steemit and where would you like to see Steemit in the next 6 months? Well I hope you know the answer to that — This is a Real Game Changer! Social media is all about user engagement. By bringing in live action role play to the equation and getting advertiser to not only pay the infrastructure bills, but also to pay the players to play... I think we might be onto something revolutionary here. Thanks @williambanks for taking the time to have a chat with SteemMag.. Looking for more awesome initiatives.. And all the best on Havin. Wow this is great! Upvoting and resteemed! Thanks @team101. Youve always been a consistent SteemMag reader..